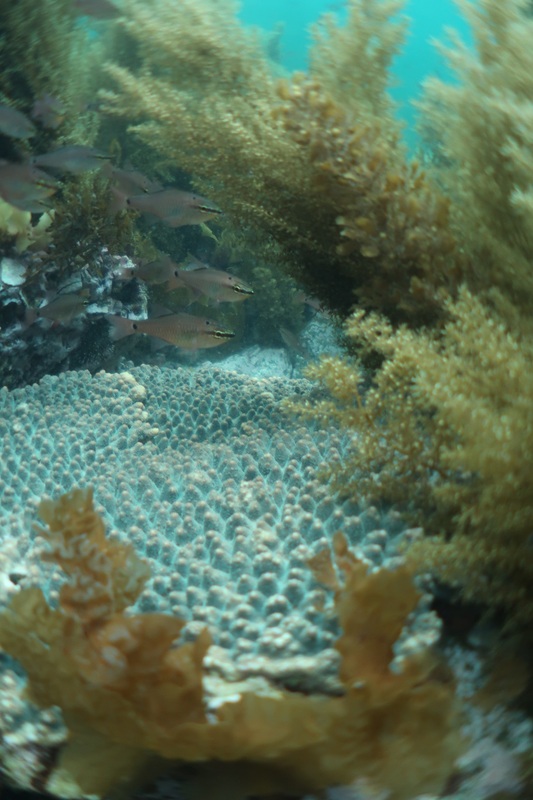 Global and local degradation of coral reefs and macroalgal beds can have ecosystem-wide impacts on biodiversity, ecological functioning, ocean resources and biogeochemical cycle. However, recently reported community shifts from temperate macroalgae to tropical corals offer conservation potential for corals at the expense of macroalgae under climate warming. Although such community shifts are sporadically reported from different regions across the world, our understanding of the patterns and driving processes behind these shifts is still limited. Here, we reconstruct long-term climate-driven range shifts for 45 species of macroalgae, corals and herbivorous fishes from over 60 years of records (mainly 1950–2015), stretching across 3,000 km of the Japanese archipelago from tropical to subarctic zones. We found that tropical corals and herbivorous fishes are expanding into existing temperate Japanese macroalgae communities, which in turn are contracting faster than they are expanding. Further, we present novel evidence that the macroalgal-to-coral shifts are facilitated by ocean warming, aided by the dominant poleward-flowing current system. The contrasting range dynamics for corals and herbivorous fishes suggest that ocean warming is promoting macroalgal-to-coral shifts both directly by increased competition from the expansion of tropical corals into the contracting temperate macroalgae, and indirectly via deforestation by the expansion of tropical herbivorous fish. Beyond individual species’ effects, our results provide novel evidence on the important role of the interaction between climate warming and ocean currents in shaping community-level responses, with concomitant changes to ecosystem structure and functioning. Further, we found that community shifts from macroalgae to corals might accelerate with future climate warming. This highlights the complexity of managing these evolving communities under future climate change, which conservation might require of a more proactive management towards climate adaptation. The research is published on the week of August 20, 2018 in Proceedings of the National Academy of Sciences of the United States of America (PNAS). Naoki H. Kumagai*, Jorge García Molinos, Hiroya Yamano, Shintaro Takao, Masahiko Fujii, Yasuhiro Yamanaka (2018) Ocean currents and herbivory drive macroalgae-to-coral community shift under climate warming. Proceedings of the National Academy of Sciences of the United States of America. This article has been published on August 20, 2018 (https://doi.org/10.1073/pnas.1716826115).